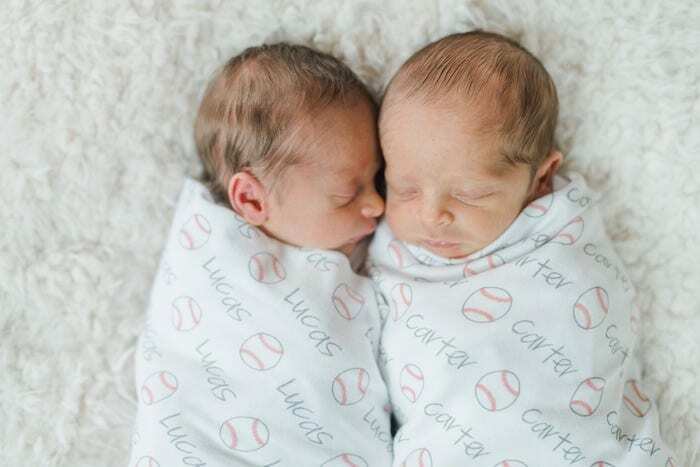 When I found out I was pregnant with twins, after the shock wore off and the excitement finally set in, I thought about becoming a stay-a-home mom, since daycare prices for two infants would essentially result in me working to pay for daycare. “It would be fun,” I thought. These were my first kids and, so to say, that I had no idea what was coming my way was an understatement. 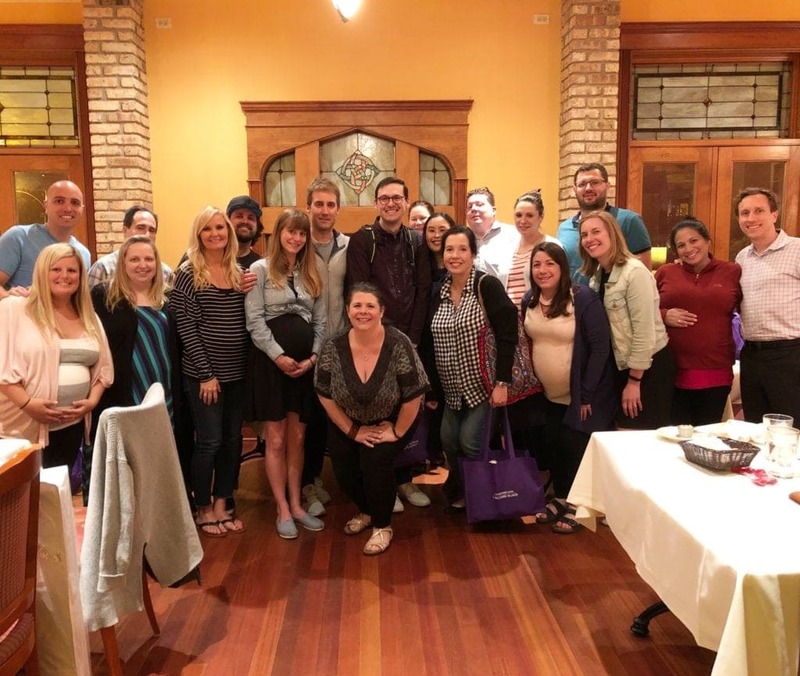 I was on bedrest for the last two and a half months of my pregnancy which resulted in me spending a lot of time thinking about what life would be like when the babies arrived. I was envisioning my stay-at-home-mom gig on maternity leave. You see, my full-time job at a non-profit organization was incredibly stressful and I figured that if I could deal with adults yelling at me all day, I could certainly handle my own flesh and blood screaming at me all day. I imagined my husband coming home from work to a delicious dinner and a spotless house. I got on Pinterest and found activities for infants and little art projects we could make. This was going to be great! Not only that, but I would be able to leave my job and spend precious, quality time with my sweet, snuggly newborns. Flash forward two months, a pre-eclampsia induced c-section, a NICU stay of different lengths for each child, and a couple of 24-hour stints of screaming babies later and I realized how naïve and stupid I must have sounded to all my friends who had children before me. It was going to be a battle to get through maternity leave, let alone become an actual super-hero — I mean, stay-at-home-mom. We were extremely lucky that my husband was able to take two paid weeks off with me considering some families don’t even get that. 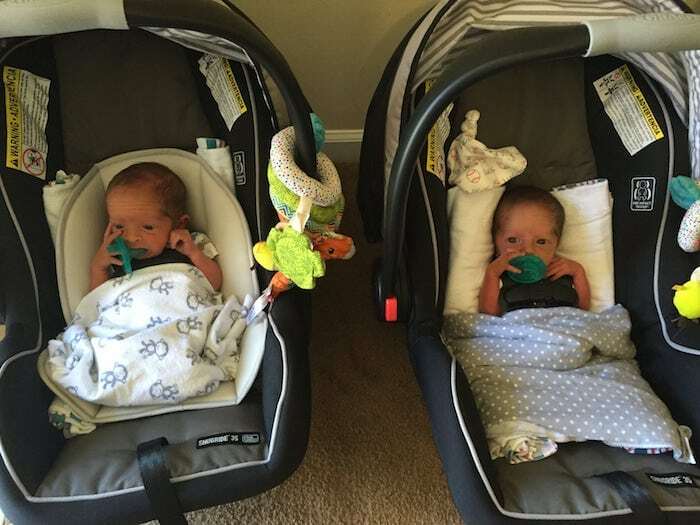 We quickly got into a routine with the boys after we spent a couple of nights watching our 4-pound babies breathe while they sleep. We split the night in half so that at least someone was getting a couple hours of precious sleep. He would take the first shift with the boys while I slept for 5 hours and then we would switch. However, as a pumping mama, I wasn’t sleeping for that entire 5 hours because going 3 hours without pumping was not an option. I was essentially a vessel of a human during those first few weeks; a walking zombie, if you will. Exhausted doesn’t describe the feeling and I’m not sure there’s even a word in the English language for it. When it was time for my husband to go back to work, I panicked. I begged him not to go as I struggled to keep my 100-pound eyelids open. He kissed us goodbye and said he’d see us soon, and I just sat, staring at my kids, wondering how I was going to do this. My pumping schedule essentially left me 30 minutes between feedings to do anything, including console my colicky baby B and flip baby A on to his stomach to avoid the flat spot on his head from getting any flatter, since all I had time to do with him was lay him on his back. I had been alone for three hours when I decided that I needed to go back to work, tomorrow. “Sleep when the baby sleeps” isn’t a thing when you have newborn twins and you’re alone. There is always a child awake. There is always a screaming child. There is always a child who needs to be changed or fed. 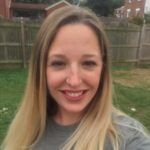 It was overwhelming, scary, and I laughed at myself for thinking that I had been tired before I had no help with the boys. My hopes and visions of me being that do-it-all-stay-at-home mom were being destroyed before me as I cried out of frustration because the boys spent most of my 30-minute pumping sessions both screaming and crying while I sat attached to a machine, unable to help them. “How do people do this?” I thought. 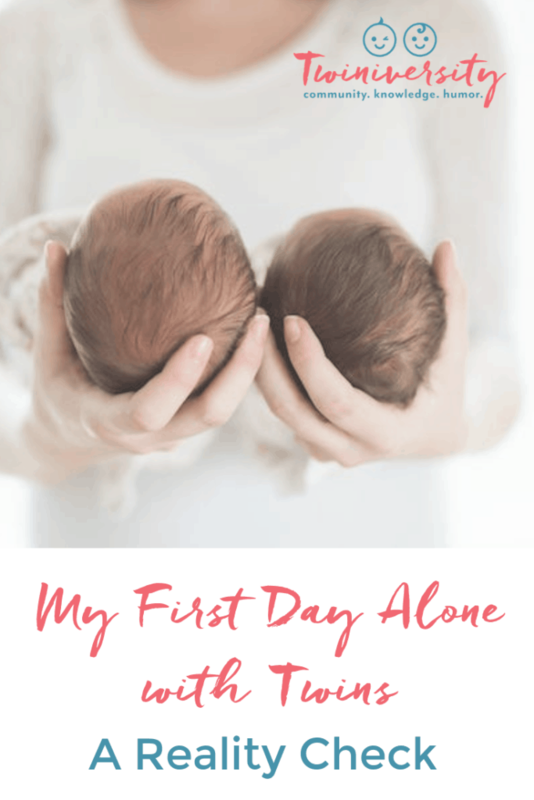 My first day alone with them was incredibly eye-opening and while I wanted to pretend like I had it under control, I was only making it harder on myself by expecting that. 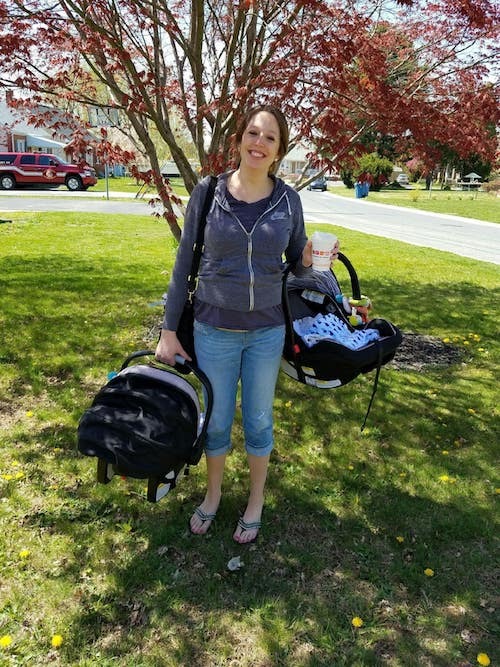 My first day alone was hard and scary but before I knew it, I learned how to feed two babies and pump at the same time. I bought a bra that held my pump to me and I got a portable pump so that I could take it with me and throw a load of laundry in while I had the chance. I learned so many tricks through trial-and-error with the boys on what they liked and didn’t like. For instance, my singing voice didn’t calm them down, but Adele’s voice did. Baby A didn’t like the swing but Baby B loved it. I learned how to breathe through the crying and laugh at the force a 5-pound baby can put behind a projectile vomit or explosive poop. I learned to accept help when it was offered and not to feel bad about it. I learned that sometimes, it’s easier to take the kids out of the house than it is to sit within the same walls all the time. No one is expecting you to know it all as a new mom and on your first day alone, remember to give yourself a break. As cliché as it is, know that these moments are fleeting. One day, you’ll look back on those first weeks and remember how strong you were and how fast it has all gone by. If you would have told me, on that first day, that I would someday be able to handle two toddlers (who run in opposite directions) with laughter and minimal stress, I wouldn’t have believed you. The first day is hard but it does get easier, and trust me when I say it only gets better from there! Kayla Andrews is a wife and mom to twin boys and three dogs. She loves wine, dessert, and laughing about the chaos of twin life. She spends most of her spare time writing and pretending like she’s going to work out. Follow her at doublethewine.com.